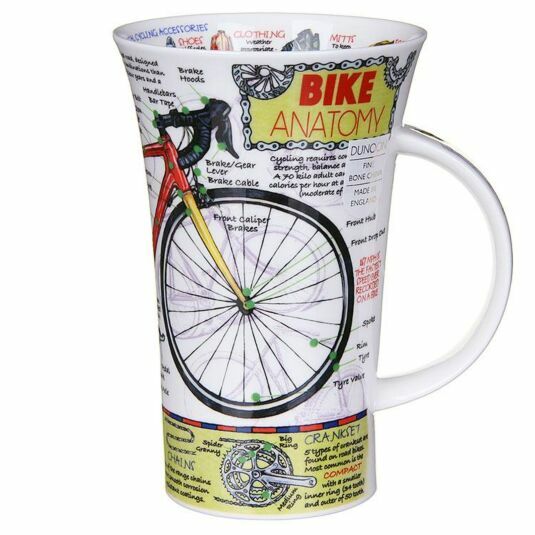 The extra space on this tall mug is the perfect place to put a wealth of information about a fascinating subject, in this case the Bike Anatomy. 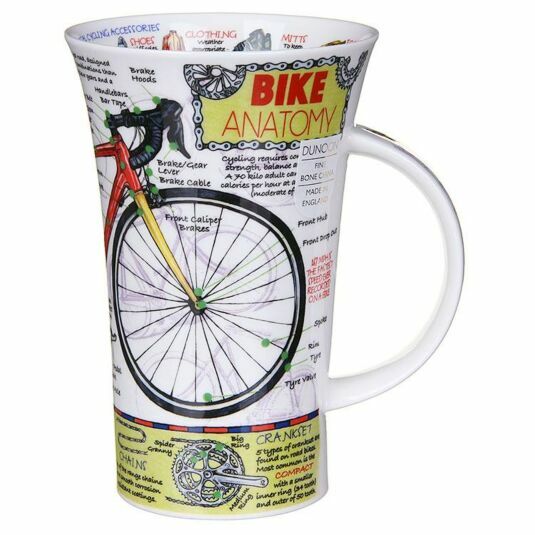 Colourfully illustrated with a wide range of interesting facts about the bike, this deep and interesting mug will keep your mind engaged while you lubricate your insides. The cup interior and handle features extra facts which are accompanied by diagrams. The large amount of liquid held by this oversized receptacle should be enough to oil your mental cogs! Become better informed while you drink your reviving beverage! This incredibly detailed design by Caroline Dadd is one of a range of informative mugs from Dunoon. Named for one of the most beautiful valleys in Scotland, Glen Coe, these large and stylishly shaped mugs are the canvasses for some of Dunoon's most popular, and certainly their most detailed, designs. With a capacity of 500ml, all designs are both dishwasher and microwave safe, with the exception of those featuring gold embellishment.